Langkawi, an island with several myths and legends is also an island of fun, sun, sea and beaches. It is one of those popular holiday getaways for locals and tourist alike and for those who would like to experience nature without the hustle and bustle of life, could visit this amazing destination for peace and serenity. Langkawi being the main island amongst ninety nine tropical islands off the north western coast off Peninsula Malaysia is a good 6 hours journey by road from Kuala Lumpur, which is the capital of Malaysia, to Kuala Kedah and then a one hour 1 and 15minutes ferry ride from one jetty to the other. The Langkawi Sky Bridge is at the end of the Cable car ride and the island’s highlight is its 410 feet long curved pedestrian cable stayed bridge in Malaysia.This suspended bridge was completed in 2004 which is built on the Machinchang Mountain. For a spectacular view of Langkawi, one could take the cable ride to the summit of Gunung Mat Cinchang and get a view of the emerald waters that surrounds the various islands with dotted boats and vessel together with the Datai Peninsula. 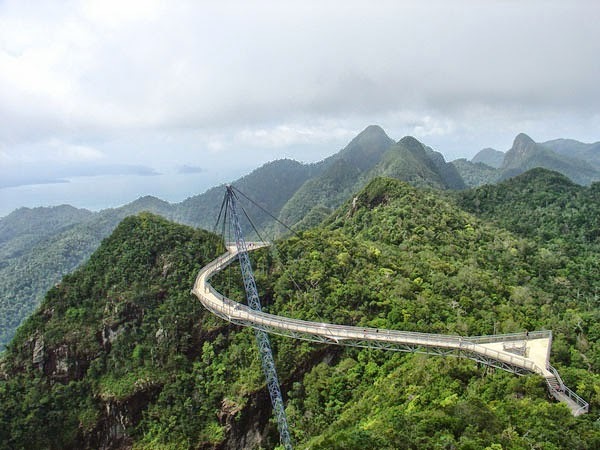 Located at 2,300 feet above sea level, the Sky Bridge can be accessed by the Langkawi Cable Car and the journey to the top begins at the Oriental Village in the upper northwest of the island near Pantai Kok. As the cable car begins to climb it tends to get a little cold when the air flows in through the ventilation openings at the top.One can experience an amazing thrill as the cable ride ascends the steep slope and the entire ride last for about ten to fifteen minutes. The cable cars halt at two stations with each station, a circular structure to move around and have a good view of the panoramic scenery of Langkawi. The sight on the way to the top of Langkawi’s second highest peak comprises of theTelaga Tujuh Waterfalls and the rainforest and travelling for a few hundred feet above, it levels out and stops at the Sky Bridge, which is the final station. One will find many stalls selling souvenirs snacks, drinks and toys. The bridge has followed safety norms with double steel railings and enclosures of wire mesh for the safety of the visitors. Measuring 125 metres in length, this structure ranks among the world’s longest curve suspension bridge. Its construction was not easy since a lot of critical factors had to be considered like the structural balance from single point, which was the top of the pylon, optimal weight management and load distribution, pre-fabrication of the bridge and on-site installation.